Are you complying with the ban on organics at landfill? 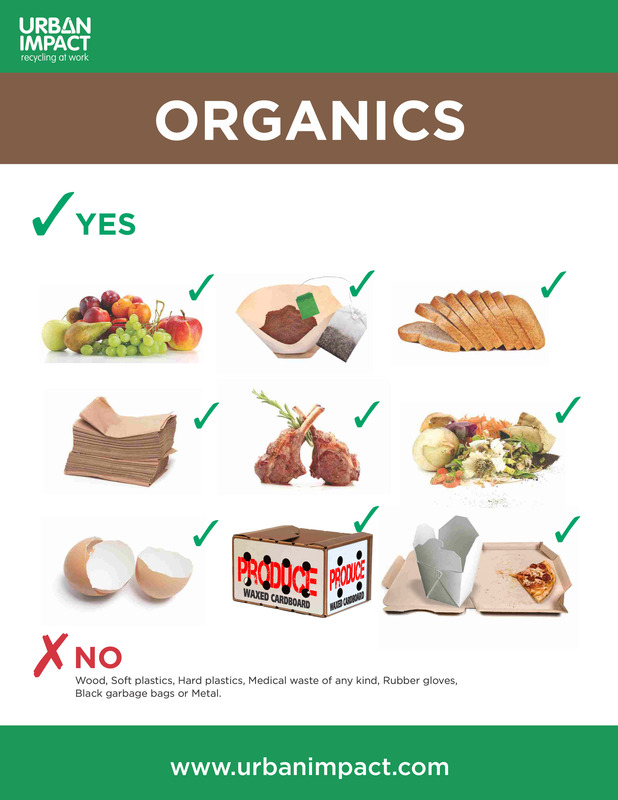 In January 2015, Metro Vancouver introduced a ban on organics at local landfills. Households and business alike must divert their organics from the garbage and have a recycling program in place. Food isn’t garbage. All food scraps – raw and cooked food, plate scrapings, leftovers, expired food, meat, bones, and dairy products – need to be recycled. In some case, if Organics are found in the garbage stream, fines will be issued. Segregating food waste will reduce the waste your send to landfill. There is a great business case for taking your food waste seriously – properly managed it will reduce the waste you send to landfill which has many positive benefits including saving you money. Urban Impact’s Organics Recycling service gives your business the opportunity to cost effectively and efficiently reduce your waste to landfill supporting your sustainability goals. Urban Impact provides Organics Recycling services for all business sizes. Restaurants, cafe's, hotels, food manufacturing, small offices and large office buildings all produce organic waste. Here is how to start. Contact us today for a free consultation on how to manage your organics. Our trained staff will evaluate your business needs and provide a recommendation for the right solution for you. Urban Impact makes Organics recycling as Easy as 1,2,3! First, Urban Impact will deliver a Organics bin for your use, secondly you use and fill the Organics bin, and lastly we pick it up, clean it and return an odour free bin for you to use again. Urban Impact has a state-of-the-art, unique truck that empties your Organics bin and washes it right at your site. We have designed a unique wash system on the trucks. The trucks have a hot water cleaning system that steam cleans your Organics bins each and every time. Our specialized Organics collection truck is rolling and here to serve you! Let Urban Impact show you how our unique and specialized service will ensure your organics bins are odour free. We are proud of our service and believe it delivers the best value to our clients. Because we wash the bin each and every time we service it, Urban Impact does not have to line the bins with a bag - this saves you money and means one less bag for the environment. Customers love our secure, leak-proof, organics collection bins with lids. Turn your food waste into a valuable resources and reduce your waste going to landfill. Let Urban Impact help you achieve your sustainability goals. We can help in a variety of ways, often a waste audit is a useful tool to review what materials remain in the garbage stream. Once you know what is there, a comprehensive plan can be made to help you divert waste! A great recycling program has a variety of key ingredients including: clear signage, convenient collection bins, well-educated staff and tenants, reporting and efficient collection services. Did you know that organic food scraps make about 30% of most businesses’ garbage? In Canada, about $31 billion worth of food is wasted annually. This equates to about $868 worth of food wasted per person per year. VCMI, Food Waste in Canada - $27 Billion Revisited, 2014. Choosing to separate food and garden organics means that this material can be beneficially reused by composting it. Organics food scraps are used to produce a range of nutrient-rich composted products.